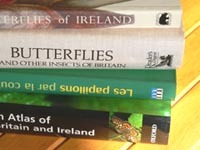 Irish Butterflies - General Information on the Butterflies of Ireland. 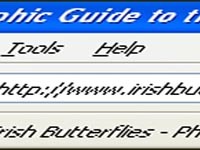 The Irish Butterflies website has been in existance for some time now, originally set up in 1997 (with irishbutterflies.com domain set up in 2000) , when there were very few butterfly sites worldwide and none covering Ireland. The aim of the original site was to provide a basic easy-to-follow non-technical guide to help people to name the butterflies they see. This version continues the original aim, but with more photos, of better quality, and with the addition of some extra features and data. General: The 'Butterfly Species' section of the website is really the main section of the website, comprising a list of species that links directly to individual pages for each species. Each species page consists of the Name (in several languages), distribution map (presence indicated by dark areas) and flight times (see accuracy information below), photo(s) of the species, and general information. 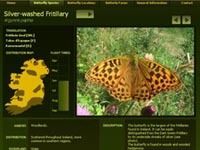 Navigation: Most species pages contain more than one photo of the butterfly. Click on the arrow buttons above (right side) the photo to see the extra photos. Mouse over each photo for more details. To navigate to the next species click on the larger arrow located to the right of the main species name. Note that this navigation will go through ALL the species, not only those within the same group. Use the browser 'back' button to return to previous species. Accuracy: Due to the size and layout of the distribution map, areas marked are only approximations. Small separate areas may be joined, or enlarged slightly, for illustrative purposes. Regarding the flight times, these are representative times only, as weather and other conditions will cause fluctuations in these times, which will also vary depending on the location. NB Mouse over images throughout the site for more details relevant to the image. It is important to continually track the species of butterflies found in Ireland (their numbers, localities etc) so any trends can be quickly spotted and endangered species protected. To this end, if you are in Ireland (either resident or a visitor) you can download a survey form which will give you the details you require to participate in the important recording of species. Please note that you don't have to be an expert to participate. Also, remember that the butterflies that are common in your area may not be common elsewhere. This survey is carried out by the National Biodiversity Data Centre. 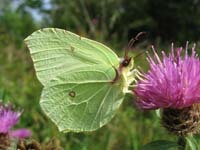 At the start of the butterfly season every year (early April) volunteers sign up to carry out regular surveys of butterflies in their chosen area. They walk a fixed path (transect) of about 1.5km and regularly (every week throughout the butterfly season) record the numbers of all the species seen on the walk. Casual sightings are also welcomed and can be submitted online. The photos that appeared in the original site were all taken on a 35mm film camera (Pentax ME Super) and subsequently scanned. Only a few of these images remain on the site (obvious by their poor quality). Fortunately, most of the images have now been replaced by better digital ones, taken on either the excellent Panasonic Lumix FZ20 digital camera, Canon Powershot A85, or Canon Powershot SX100. Photographs for the web do not require a high pixel count so most digital cameras are suitable. In general, butterfly photography requires only a little skill but a lot of patience and luck (and good sunny weather). NB All photos are copyrighted originals taken by myself and permission must be received before any are reproduced.